A study is under way at Emory University testing the value of meditation in helping people cope with stress. The Compassion and Attention Longitudinal Meditation Study (CALM) will help scientists determine how people’s bodies, minds and hearts respond to stress and which specific meditation practices are better at turning down those responses. 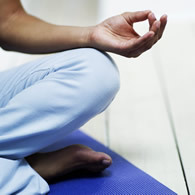 "While much attention has been paid to meditation practices that emphasize calming the mind, improving focused attention or developing mindfulness, less is known about meditation practices designed to specifically foster compassion, and what specific problems can be alleviated through this practice," says Charles Raison, MD, associate professor in Emory’s Department of Psychiatry and Behavioral Sciences, and principal investigator of the study. Raison and principle contemplative investigator, Geshe Lobsang Tenzin Negi, PhD, senior lecturer in the Emory Department of Religion, collaborated on an earlier study at Emory showing that college students who regularly practiced compassion meditation had a significant reduction in stress and physical responses to stress. The success of this initial study led the pair to embark on an expanded protocol for adults. The CALM study has three different components. The main component, which is funded by a federal grant, is called the “Mechanisms of Meditation.” This aspect of the study compares compassion meditation with two other interventions – mindfulness training and a series of health-related lectures. Participants are randomized into one of the three interventions. A second component involves the use of an electronically activated recorder (called the “EAR”) that is worn by the participants before beginning and after completion of the meditation interventions. The recorder will be used to evaluate the effect of the study interventions on the participants’ social behavior by periodically recording bits and pieces of ambient sounds from participants’ daily lives. The third component involves neuroimaging of the participants to determine if compassion meditation and mindfulness meditation have different effects on brain architecture and change the function of empathic pathways of the brain. Negi, who is president and spiritual director of Drepung Loseling Monastery, Inc., designed the compassion meditation practices for both of the studies. “Compassion is a universal spiritual value,” says Negi. “Understanding how compassion contributes to the wellness of society by bringing the physical dimension to the neurological makes it more holistic, complete. The National Center for Complementary and Alternative Medicine provided study funding, part of which comes through the American Recovery and Reinvestment Act. The study has also received private funding from Joni Winston of Atlanta. Other investigators in the study include Thaddeus W. Pace, PhD, Brooke Dodson-Lavelle, Brendan Ozawa-de Silva, PhD, Teresa I. Sivilli, Daniel D. Adame, PhD, Steven P. Cole, PhD, James K. Rilling, PhD, Jennifer Mascaro, and Gaelle Desbordes, PhD (Emory University); Eric Schwartz, PhD, (Boston University); Matthias Mehl, PhD (University of Arizona). Researchers from Harvard University and Boston University are leading the neuroimaging portion of the study. Raison and Negi are co-directors of the Emory Collaborative for Contemplative Studies, which is a component of the Emory-Tibet partnership, and one of the University‘s key strategic initiatives. Video: "The Compassion and Attention Longitudinal Meditation Study (CALM)"
Video: "Compassion Meditation: A New Take on an Ancient Buddist Practice"
Video: Mindfulness: What Is It?